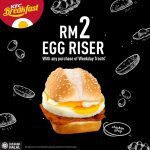 KFC Malaysia offer special promo. 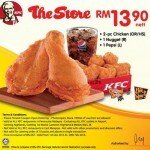 Enjoy a meal set of 3 pieces Chicken, 1 colonel burger , 2 regular whipped potato and 2 regular pepsi at only RM23 nett. 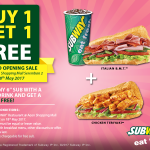 To enjoy this offers simply print out the coupon and present upon ordering. Voucher is valid until 15 November 2017. Terms and conditions apply. 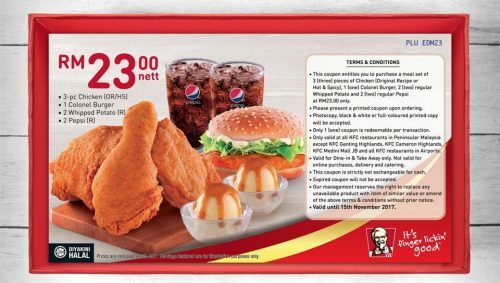 This coupon is entitles you to purchase a meal set of 3 pieces Chicken, 1 colonel burger , 2 regular whipped potato and 2 regular pepsi at RM23. 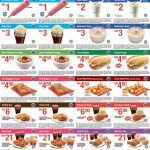 Please present a printed coupon upon ordering. Photocopy, black and white or full coloured printed copy will be accepted. Only 1 coupon is redeemable per transaction. Valid for dine in and take away only. 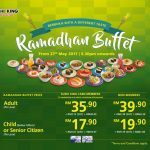 Sushi King Offer Ramadhan Buffet Deal!